What is the difference between ex-show room price and on road prices. Does on road price include insurance and RTO Give details. ex-showroom price is price which doesnt include any tax.. octroi, insurance, RTO tax etc. while onroad price is price including all taxes you pay (including the above mentioned taxes) to drive your vehicle at your home. yes it includes all thing, but it changes with states and cities, so better contact your local dealer..
Why delivery problem? There is waiting list for more than 2/3 months. Is the problem at dealer level or supply from company. I am fed up with this waiting list, what is the next alternative? TVS scootys are readily available. 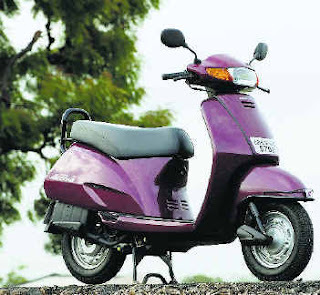 Should I go for TVS Scooty or wait for 2/3 months. i think the reason is that their plant might not be capable of supply of vehicles. i have also heard that honda is planning for plant expansion. I had booked Honda Active (Delux model, Silver colour) on 10.12.2009. At the time of booking I was promised delivery within one and half months. Now the dealer at Solapur (Maharastra) says delivery will be given at the end of of February. Is there any control from the company over their dealers.